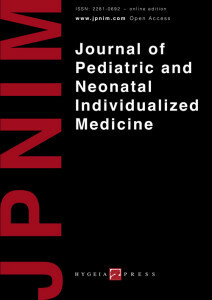 The Journal of Pediatric and Neonatal Individualized Medicine is a peer-reviewed interdisciplinary journal which provides a forum on new perspectives in pediatric and neonatal medicine. The aim is to discuss and to bring readers up to date on the latest in research and clinical pediatrics and neonatology. Special emphasis is on the developmental origin of health and disease, perinatal programming and on the so-called ‘-omics’ sciences. Systems medicine blazes a revolutionary trail from reductionist to holistic medicine, from descriptive medicine to predictive medicine, from an epidemiological perspective to a personalized approach. The journal will be relevant to clinicians and researcher concerned with personalized care for newborns and children. Medical humanities will also be considered in a tailored way. You can find the Author Guidelines here. JPNIM articles are indexed in Scopus; essential data for each JPNIM’s article are indexed by mEDRA (the multilingual European Registration Agency of Digital Object Identifiers – DOIs) and DOIs are assigned to all JPNIM contents; all JPNIM articles are indexed in Google Scholar; JPNIM is included in the Emerging Sources Citation Index, which is a new index within the Clarivate Analytics’ (formerly Thomson Reuters’) Web of Science, JPNIM is listed in the NLM (National Library of Medicine) Catalog; JPNIM is listed and indexed in DOAJ (Directory of Open Access Journals); the current number of JPNIM is indexed in JournalTOCs (a database of scholarly journal Tables of Contents created by the Heriot-Watt University); JPNIM is listed in the browsable journals list maintained by HINARI (a programme set up by WHO together with major publishers, that enables low- and middle- income countries to gain access to one of the world’s largest collections of biomedical and health literature); JPNIM is listed in Ulrichsweb (Ulrich’s periodicals database: a global serials directory); JPNIM is indexed in SHERPA/RoMEO (database of publishers’ policies on copyright and self-archiving); JPNIM is listed in WorldCat; JPNIM is listed in the list of free medical journals about pediatrics and adolescence of The Geneva Foundation for Medical Education and Research (GFMER); JPNIM is listed in the list of free journals recommended by the Italian Society of Neonatology (Società Italiana di Neonatologia – SIN). Long-term preservation is ensured by Portico (a digital preservation and electronic archiving service which is part of ITHAKA, a not-for-profit organization helping the academic community use digital technologies to preserve the scholarly record and to advance research and teaching in sustainable ways). You can read the last issue of the journal here; the archive can be accessed here. All JPNIM articles are available as PDF files and are accessible in Open Access immediately upon publication.